I received my first library card during a kindergarten field trip that my mother served as a chaperone on. Until then, my mom was unaware of the magical place that let you borrow books, for free. My mom was always a voracious reader, and each trip to Jamaica to pick up my dad's foreign newspaper included a stop at a used bookstore where she would trade in her old paperbacks for ones she hadn't read. Since her command of English was limited to speaking enough to get by, and inventive cussing, her choices for books were also limited. She was fortunate to locate this store that sold books in Spanish, however being in Jamaica and too far to obviously walk, her reading was limited as well. This changed with the discovery of the library and my card which would allow her to check out books as much and as often as she wanted. It also got me hooked on reading. The summer of 1982 was spent in the library. Every Wednesday or Thursday we'd wake up early, get my sister into the stroller and walk the several blocks and spends hours reading, and enjoying the air conditioning. Usually on the way home, before my sister could get too fussy, my mom would take advantage of excursion into the heat and we'd stop at the Odd Lots store for whatever the house needed at the time. If I played my cards right, I could usually talk my mom into White Castle across the street. On one such trip, I was in charge of carrying the library books in a lovely cloth tote bag we'd received for being "Star Readers" that summer. I remember bouncing the bag back and forth as it hung on my little shoulder, pretending to be an explorer carrying my treasure as we walked the aisles at the Odd Lots. I told my mom I'd be in the toy aisle and was given my leave. I looked at the same toys I had seen the previous week, peg by peg. Nothing new; nothing exciting. I had a bag of Encyclopedia Brown books, and this trip was delaying my mystery hunting. They looked like Barbie dolls. Some were blonde. Some brunette. Each wore a gown, or some other fancy outfit. One looked like Dolly Parton to me. They were beautiful... But what really caught my eye was their size. They were tiny. They were Star Wars tiny. They were little action figure sized Barbie dolls! My bag of mystery books forgotten, all I could see were tiny dolls. 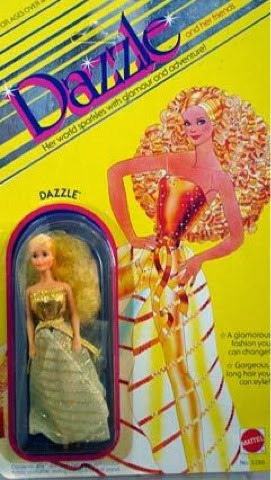 I was dazzled by Mattel's Dazzle Dolls. My mom found me staring open mouthed at the display. I didn't say a word. She took one look at me, and one look at the dolls and said, "I have enough to get you a couple but we'll have to skip White Castle." White Castle? How can you think of White Castle at a time like this?! These are tiny Barbie dolls! What I said was, "It's ok. I just want a cheese sandwich for lunch." I left with two Dazzle Dolls. One in a dress and one in a western pantsuit. The next week, it happened again. And then the following week as well. By the start of the school year I had each one pictured on the back of the package and one of the boyfriends. I also read through all the children's book section and started in on the adult fiction section at the library before first grade.